Circa 16th to 18th Century, or earlier. Height: approx.10 in. (25.4 cm. ); Diameter: approx. 12 in. (30.5 cm.). Provenance: A Private Southern California Collection, excavated on private property. 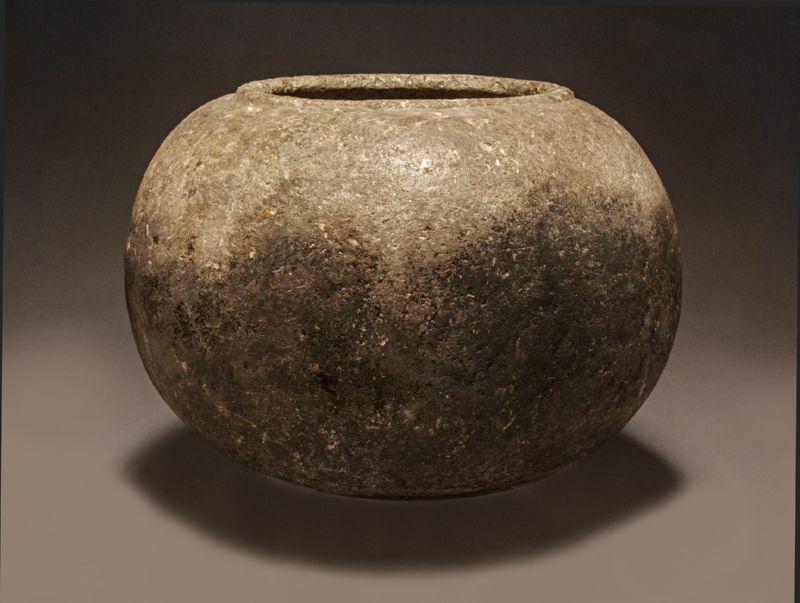 This stone bowl is spherical in form. It was carved out of a large solid chunk of steatite, and was possibly quarried on Catalina Island, then taken by canoe to the mainland. It was worked on the exterior until smooth and symmetrically globular. Next, an opening was carved into the top, and an interior was hollowed out to accommodate ample space for use as a cooking vessel with relatively thin walls. The round opening consists of a lip carved around the edge, which is raised slightly above the smooth shoulder, The lip is incised with cross-hatching upon the entire circumference of the opening. The blackness on the lower half of the olla is evidence of native use involving fire. The entire object exhibits a lovely patina of great age.